The island of Alcatraz in the San Francisco was a federal prison from 1934 to 1963. After it was decommissioned, the island was listed as surplus federal property. That designation drew the interest of Native Americans, because under the terms of the 1868 Treaty of Fort Laramie, any federal property designated as surplus was to be returned to the natives who originally occupied it. 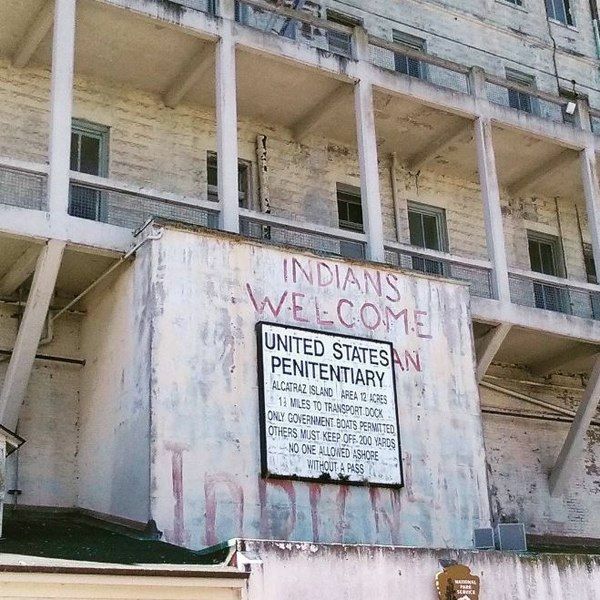 In 1969, after the San Francisco American Indian Center was destroyed by fire, a group of Native American protesters went to Alcatraz and stayed there for 19 months. Soon about 100 Native Americans, mostly students and activists from urban communities, were living the island that had otherwise seemed destined to fall into decay, or the whims of private developers. By Thanksgiving of 1969, the island had blossomed into a well-rounded community with elected council members, and a regular voting system and 400 occupants. The US government first took a wait and see attitude, but eventually blockaded supplies from reaching the island, and even cut off the electricity. Read about the 1969 occupation of Alcatraz and see plenty of pictures at Messy Nessy Chic.